AMD floundering at the hands of an irresistible GeForce? 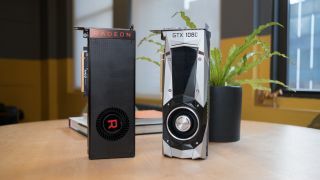 AMD may be forging forwards and taking turf in the battle of the processors with Ryzen, but the GPU arena is a very different kettle of pixels, with the firm’s new Vega tech floundering here, and Nvidia taking a greater share of the graphics card market according to new figures. The add-in graphics board report for Q3 of this year comes from Jon Peddie Research, taking a snapshot of the discrete GPU market (i.e. separate graphics cards, with integrated graphics not included), and finding that Nvidia now holds a share of 72.8%, up 2.6% year-on-year, and up a little bit more at 3.1% compared to the previous quarter. AMD’s graphics card share has dropped to 27.2%, basically the remainder of the market, with a corresponding shift in the other direction compared to Nvidia. Last quarter AMD held a 30.3% market share, so the new Vega GPUs, which officially launched back in August, have seemingly failed to make a positive impact. Initial stock and pricing issues with AMD’s Radeon RX Vega cards may not have helped the company’s cause, mind you. At this point, it’s too early to call an entire generation of graphics cards a failure, but this obviously won’t be welcome news over at AMD towers. In the interests of balance, a recent hardware report based on Firefox users showed that AMD actually edges out Nvidia when you take into account integrated as well as discrete graphics (although Intel is the clear champ in the former department). There are reasons for this, though, which we discussed earlier this month. On an overall level, Jon Peddie noted that the GPU market had an ‘outstanding’ third quarter this year, with 21.5% growth year-on-year, and 29.1% growth compared to the previous quarter. Most of this growth was driven by PC gamers buying graphics cards according to the analyst firm, with the impact of esports having a measurable influence. In other words, as more people play titles like Overwatch – which is encouraging the scouting of the massed ranks of the player base to look for potential pro gamers to join the big teams – folks are upgrading their GPUs to become more competitive.